This Cornell brew guru is working to elevate the science of cider to that of fine wine. 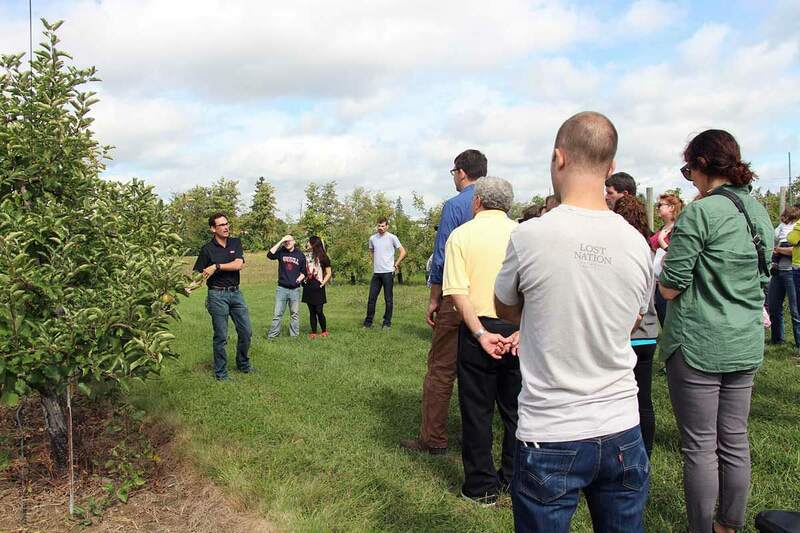 Greg Peck discusses orchard design at the Cornell Orchards during the Finger Lakes Cider Week. Their professor, Dr. Gregory Peck, is arguably the nation’s preeminent hard cider scientist. And Cornell, in the heart of upstate New York’s apple growing region, is arguably the epicenter of the nation’s hard cider explosion. Since 2011, the hard cider industry in the United States has grown nearly 900 percent. And New York, with 75 cider producers and counting, ferments more apples into alcohol than any other state. “This class will be the first time that hard cider has been taught to undergraduates anywhere in the country, as far as we know,” says Peck, with obvious pride. Problem number one is that American orchardists grow almost exclusively apple varieties intended for juicing, baking or eating fresh, which are a very different beast than the apple varieties historically grown for hard cider, most of which originate in Europe. There’s a good reason for that: cider apples taste awful before they are made into cider. “Spitters,” Peck calls them. They’ll make your mouth pucker like you ate a spoonful of earth. Fujis and Galas and Winesaps and all the other apples you’ll find it a grocery store or farmers market are considered dessert apples – they might be sweet, they might be tart, but they definitely aren’t bitter or astringent. 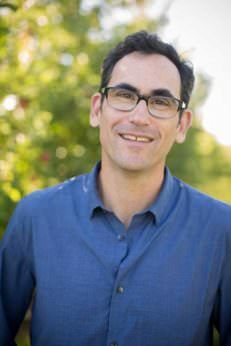 Peck has evaluated the chemistry of dozens of American-grown dessert apples and traditional European cider apples, and he’s found that on average the former has 20 percent less tannin content than the latter. It’s akin to making wine out of table grapes, he says: table grapes are sweet and low in tannins, while the European wine grape – which is literally a different species – isn’t very pleasant to bite into. The team has begun interbreeding commercially successful dessert apple varieties with older cider varieties in hopes of creating new cider-worthy hybrids with the disease resistance and production levels required by commercial growers. Peck and his colleagues at Cornell are starting to flesh out the art and science of how to get more of that “mouth feel” into hard cider. Having the right varieties is one thing, but it takes several years for a newly planted apple tree to begin producing, and there are many other variables to consider. One item on the hard cider research agenda is a study on how common apple fungicides affect the naturally occurring yeasts needed for successful fermentation. Another is to determine how temperature and light affect polyphenol development, as these factors can be controlled through pruning practices and orchard design. The Cornell team has also begun interbreeding commercially successful dessert apple varieties with older cider varieties in hopes of creating new cider-worthy hybrids with the disease resistance and production levels required by commercial growers. And a new research orchard will soon be planted to determine which are best suited to local conditions and the cultivation practices of modern, high density orchards. From an orchard management perspective, one of the most revelatory findings to date is that having more, smaller apples on the tree, as opposed to fewer, larger apples, has a dramatic impact on polyphenol content. Orchardists typically thin out up to half of the apples on a tree while the fruit is still small, in order to produce larger supermarket-quality fruit, but it turns out that that’s counterproductive when it comes to a cider crop. Peck’s research shows that minimal thinning results in 37 percent greater polyphenol content compared to typical thinning practices. Will the current cider craze soon lead to a cider bubble? Peck doesn’t see that coming anytime soon. At a recent national cider conference, he says 20 percent of the people in attendance were planning to open a cidery within the next few years, according to a survey of the participants. So it sounds like the exponential growth curve of the industry is likely to continue for the foreseeable future. And if Peck has his way, hard cider in America won’t mushroom into a bland, volume-oriented industry, but will continue as a renaissance of artisanal producers. He says so far there are only a few hundred acres of true cider apple varieties planted in the Northeast, so it’s very much a grower’s market. “From our surveys we found that all producers, from the smallest to the largest, would love to be able use more bitter apples, but they are just not available,” says Peck. “There is a huge supply and demand imbalance right now, so prices are 2 to 3 times higher for cider apples than culinary apples.” So to all the farmers out there looking for a new niche, says Peck, consider planting a few acres of a good spitter.